Scientists have been investigating the negative effects that the hyperactivation of fibrosis has on fibrotic diseases and cancer. A KAIST research team unveiled a positive feedback loop that bi-stably activates fibroblasts in collaboration with Samsung Medical Center. This finding will contribute to developing therapeutic targets for both fibrosis and cancer. Human fibroblasts are dormant in normal tissue, but show radical activation during wound healing. However, the principle that induces their explosive activation has not yet been identified. 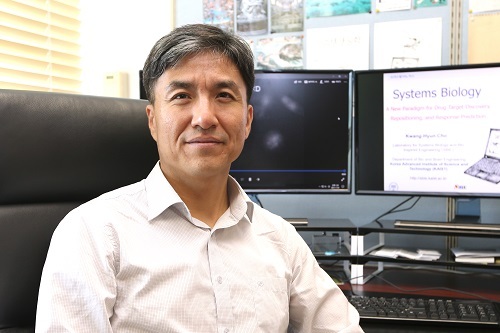 Here, Professor Kwang-Hyun Cho from the Department of Bio and Brain Engineering, in collaboration with Professor Seok-Hyung Kim from Samsung Medical Center, discovered the principle of a circuit that continuously activates fibroblasts. They constructed a positive feedback loops (PFLs) where Twist1, Prrx1, and Tenascin-C (TNC) molecules consecutively activate fibroblasts. They confirmed that these are the main inducers of fibroblast activation by conducting various experiments, including molecular biological tests, mathematical modeling, animal testing, and computer simulations to conclude that they are the main inducers of fibroblast activation. According to their research, Twist 1 is a key regulator of cancer-associated fibroblasts, which directly upregulates Prrx1 and then triggers TNC, which also increases Twist1 expression. This circuit consequently forms a Twist-Prrx1-TNC positive feedback loop. Activated fibroblasts need to be deactivated after wounds are healed. However, if the PFLs continue, the fibroblasts become the major cause of worsening fibrotic diseases and cancers. Therefore, the team expects that Twist1-Prrx1-TNC positive PFLs will be applied for novel and effective therapeutic targeting of fibrotic diseases and cancers. This research was published in Nature Communications on August 1, 2018. Figure 1. Twist1 increases tenascin-c expression in cancer-associated fibroblasts. 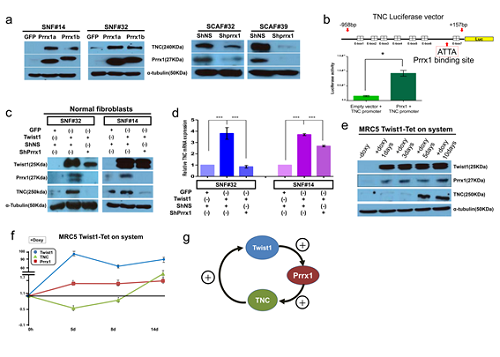 Twist1 is a potent but indirect inducer of tenascin-c (TNC), which is essential for maintaining Twist1 expression in cancer-associated fibroblasts (CAFs). Figure 2. Summary of the study. 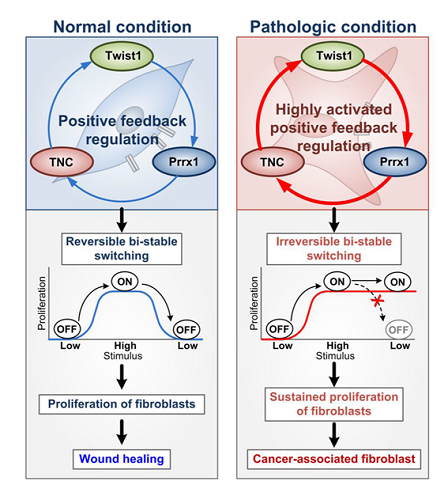 The Twist1-Prrx1-TNC positive feedback regulation provides clues for understanding the activation of fibroblasts during wound healing under normal conditions, as well as abnormally activated fibroblasts in pathological conditions such as cancerous and fibrotic diseases. Under normal conditions, the PFL acts as a reversible bistable switch by which the activation of fibroblasts is “ON" above a sufficient level of stimulation and “OFF" for the withdrawal of the stimulus. However, this switch can be permanently turned on under pathologic conditions by continued activation of the PFL, resulting in sustained proliferation of fibroblasts.